A new, albeit rather short, Discworld yarn (Thief of Time, 2001, etc. 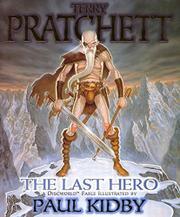 ), profusely illustrated by popular Discworld artist Kidby in an oversized format. This time out, Cohen the Barbarian—he still swings a mean sword, but he’s so old he needs a walking-stick, and can’t always remember where he put his dentures—and assorted old friends (very old friends) plan to go out in a blaze of glory. None of them are happy about growing old, and who’s to blame except the gods? So they plan to return—with interest—what the first hero, Mazda, stole from the gods long ago. If they succeed, of course, the Discworld’s magical field will shut down and every living thing will die. So Lord Vetinari, ruler of the huge, rotting city Ankh-Morpork, puts together a team that, by a million-to-one shot, just might save the day: the great inventor and artist Leonard of Quirm, Captain Carrot of the City Watch, and Rincewind the incompetent wizard. Moderately funny, aimed primarily at Discworld addicts and holiday-season gift-givers.